Neutral colors are increasingly popular with modern parents, and experts say they are ideal for parents that don’t know if it’s going to be a boy or a girl. Got a little bundle of joy on the way? You’ve likely got a big bundle of concerns about where and how to prep the baby’s room. Fear not, future parent: with the right planning and approach, you can create the ideal nursery without being cursory. The first step, of course, is to pick the right location. Additionally, as it’s optimal to have a dark space for the baby to sleep in, “it’s wise to select a room with windows that can easily be covered with blackout curtains,” she adds. 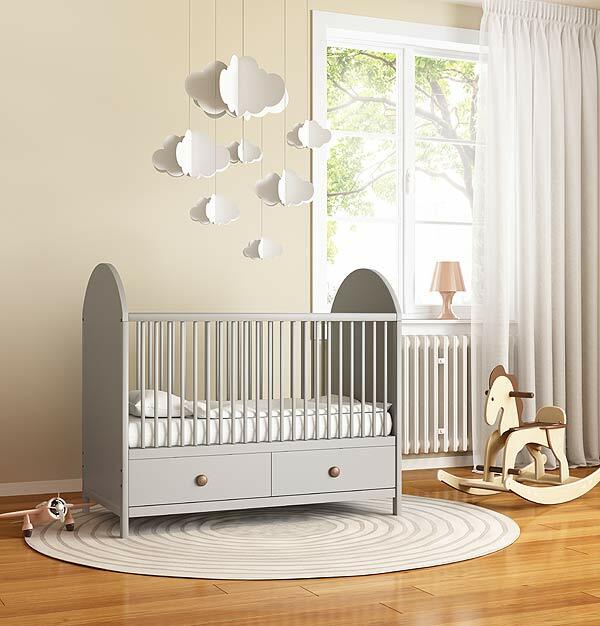 When it comes to paint colors, it’s best to play it safe, especially if you don’t know the baby’s gender and you aren’t going to design the room specifically for a boy or a girl. “Gender-neutral colors are often best, as the baby can not only grow with the nursery more easily, but you can use the same colors for future children without having to repaint,” says Olivia Howell, nursery design expert for GuguGuru.com, a site that offers baby registry product recommendations. Howell recommends choosing low VOC paints and getting the job done well before your due date. If neutrals are too boring, “select a soft tone of your favorite color. The most important consideration is that the colors in the space make you feel good,” says Gaddis. She adds that soft yellow promotes cheerfulness and a sense of connectedness; light greens and blues represent nature and growth; deeper green inspires mental development, while blue suggests calm; pink hues encourage curiosity and creativity; and red, a stimulating color, should only be presented during playtime. Nicole Sullivan, a new mother from Norwell, Mass., chose Sherwin Williams Sea Salt for her infant’s wall colors. Speaking of which, think carefully about illumination. “You will be coming into this room at all hours of the day and night to attend to your baby, so having lots of adequate light will make this much easier on you and your eyes. If you have a big window that lets in lots of natural light during the day and a lovely curtain to cover it up at night, that would be perfect,” says Bonny Ford, editor of the FurnishMyWay Blog. Minimum furniture essentials for the room include a crib; crib mattress; rocker, glider or easy chair; changing station; and lamp. Optional items can include a diaper pail; floating shelves, baskets and buckets for storage; and an Ottoman with hidden storage. “Keep it simple. Only bring in essential furniture and items, making it easier to maintain organization, cleanliness and safety in the room,” Gaddis suggests. Expect to pay as little as $1,000 up to or exceeding $3,000 on your nursery project. And prepare for a facelift a few years down the road. “You’ll likely have to redo this room in three to four years, which is around the age that children begin to express their own ideas for room decor and will likely have a need for extended toy storage,” Gaddis says.